Please also pray for the repose of the soul of Mrs Rita McCarrick RIP, as her first anniversary will be on 29th May. She was one of the four Pilgrims to attend the first Annual GK Chesterton Pilgrimage. Fr Christopher: is visiting his father's sister and sister in law this week. Back Saturday night. 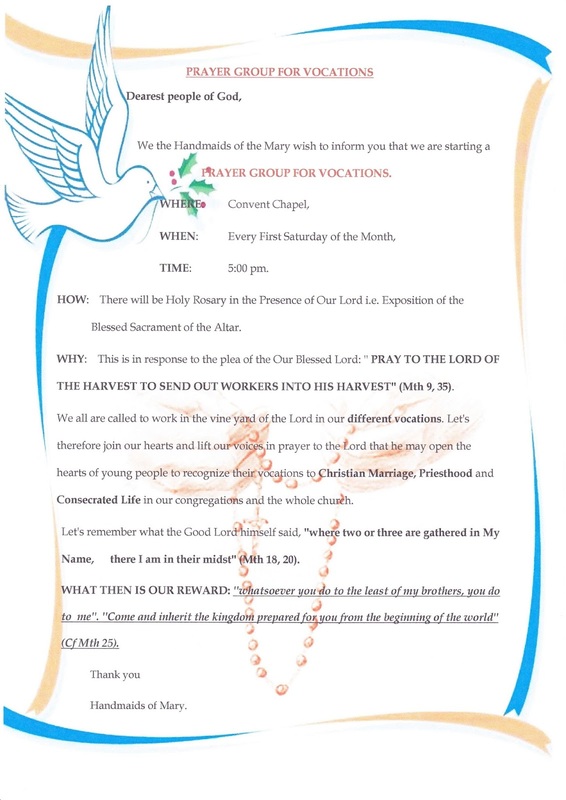 Monthly Prayer meeting for Vocations: Next Saturday 5pm at the convent. African & Caribbean Meeting: after the 9.30 Mass today to practise the hymns for next week. 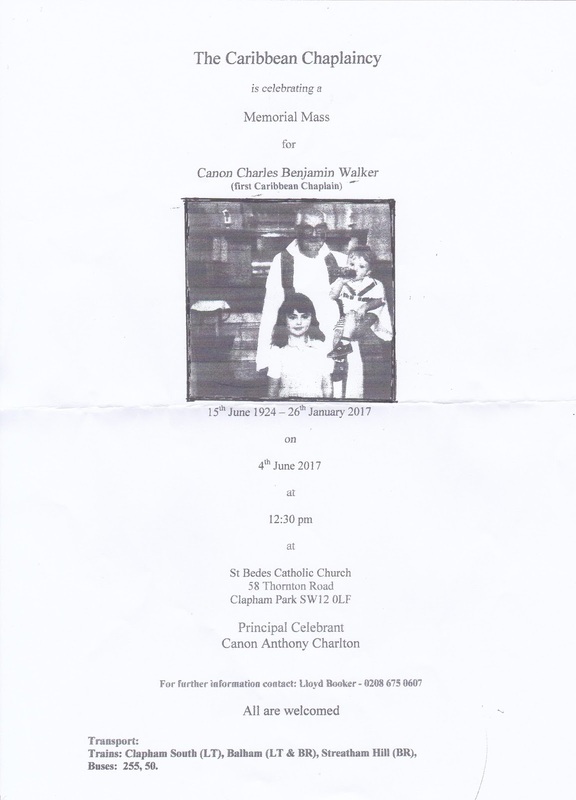 Memorial Mass for Canon Charles Walker (1924-2017): Next Sunday at 12.30pm the Caribbean Chaplaincy will celebrate a Mass for Canon Charles who died in January. He was the first Caribbean Chaplain. The celebrant for this Mass will be Canon Anthony Charlton. All are welcome. Cleaners this week: Angela Ilo & Teresa Ablett. 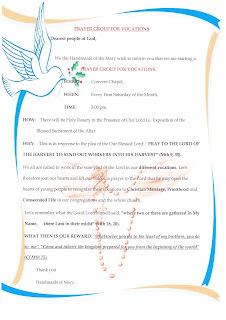 Annual Procession in honour of Our Lady of Lourdes: Today at 5pm – Orione House, 12 Station Road, Hampton Wick, KT1 4HG. There will be Mass at Orione House after the procession, followed by refreshments in the grounds. Enquiries to: 07921 125 283. 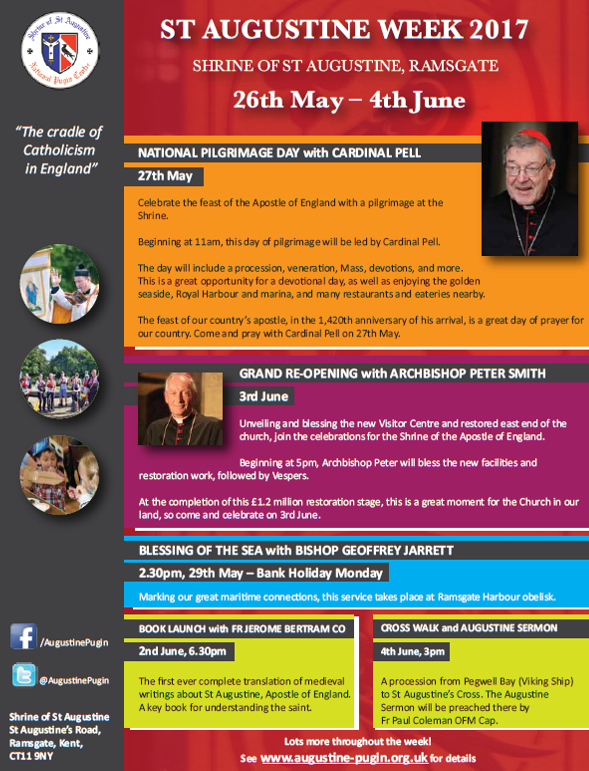 St Augustine Week - Ramsgate 26th May – 4th June: on Monday 29th at 2.30pm there will be the Blessing of the Sea at Ramsgate Royal Harbour (meet by the Obelisk, next to the building covered in scaffolding). This will be celebrated by Bishop Geoffrey Jarrett, Bishop Emeritus of Lismore, Australia. 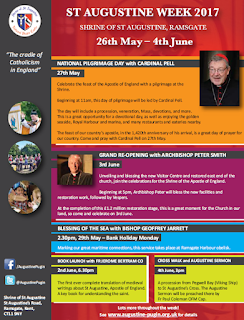 On 3rd June at 5pm, Archbishop Peter Smith will be re-opening the church & Visitor Centre, following the major restoration, with sung Vespers. On 4th June at 3pm (there will be sung Mass at 12 noon) there will be the annual procession to St Augustine’s Cross – the procession begins at the Viking Ship at Pegwell Bay, and travels about a mile to the Cross. At the Cross, there will be the annual Augustine Sermon, this year preached by Fr Paul Coleman OFM Cap., who is Provincial of the Capuchin Franciscans. Following this, the sisters of Minster Abbey invite everyone for refreshments at Minster.